Crispy, salty parmesan crisps can be eaten as a snack, used as a garnish, or crumbled over salads, pasta, and other dishes. For breakfast, try Poached Eggs with Parmesan Crisps. Mix together the grated cheese and pepper. Line a cookie sheet with either parchment paper or a nonstick silicone baking pad. Using a Tablespoon measurement, drop even mounds of Parmesan cheese on the baking sheet. Use your fingers to pat each mound of cheese into a thin circle about 3 inches across in size. Make sure none of the circles are touching. Or, if you want perfectly round crisps, set a biscuit cutter down on the baking sheet and sprinkle a thin layer of cheese inside the round mold. Repeat until all the cheese is gone. Bake five minutes, or until golden and crisp. When the crisps are still warm, you can fold them around the handle of a wooden spoon to give them some shape, or just leave the crisps as flat rounds. 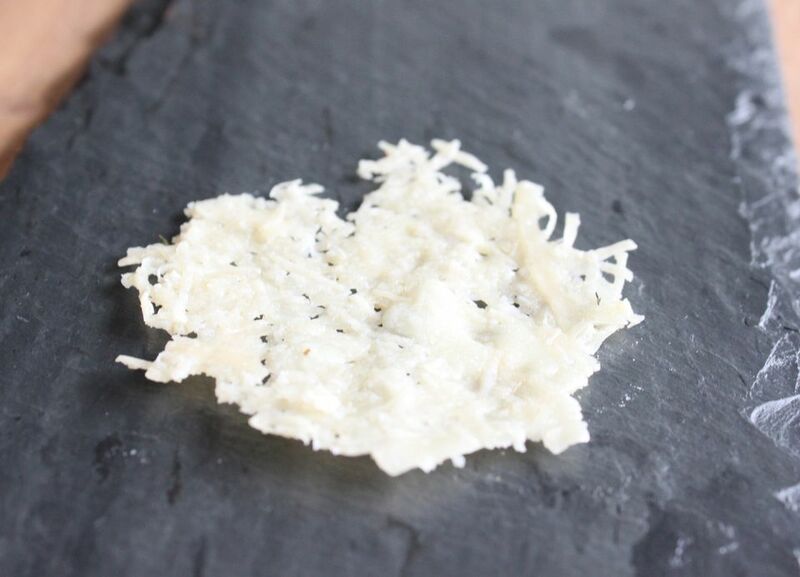 Parmesan crisps are best when eaten soon after they're made. If kept as leftovers, the crisps tend to get less crispy and more chewy. If you have extra Parmesan cheese after making this recipe, check out more recipes using Parmesan cheese.